I love going to the market and finding ingredients that inspire me to try something new. For a while now, I have been eyeing the guanciale at Oyama but never really knew what to do with it. When I was at the market last week, I thought I would pick one up, and save for the following Monday’s dinner. That gave me a few days to pour over recipes to decide what best to do with this wonderful piece of cured meat. 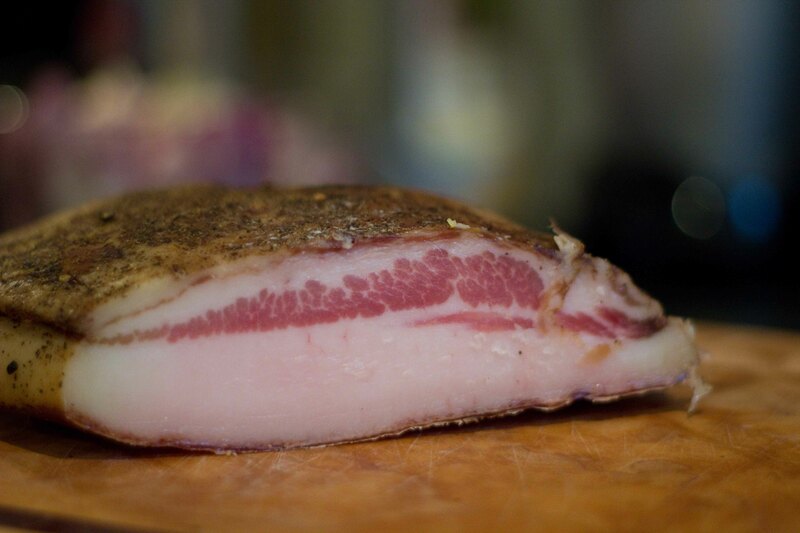 Guanciale is made from pork jowls that are cured with salt and pepper. A richer taste than pancetta, I’m sure the meat:fat ratio helps make this delicious. 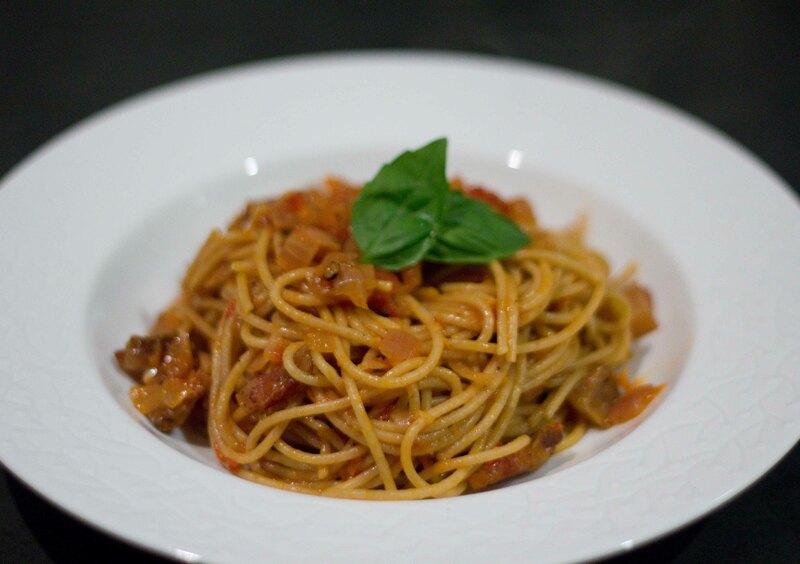 It seemed like the best and most traditional use of guanciale is by making an Amatriciana sauce. I liked the fact that this sauce has so few ingredients, allowing all of the components to shine through. I followed Mario Batali’s recipe somewhat, (because I can never use just one recipe) and allowed the flavours to incorporate a bit more by simmering over the stove for longer than stated. With so few ingredients, it was amazing how complex the sauce was. 1. Put guanciale in a heavy bottom pot/pan and cook over medium-low heat until most of the fat has been rendered off, stirring occasionally. Remove the meat to a plate lined with paper towels and leave half the fat (or less) in the pan. Add garlic, onion and chilis and saute until the onions are soft & sweet. 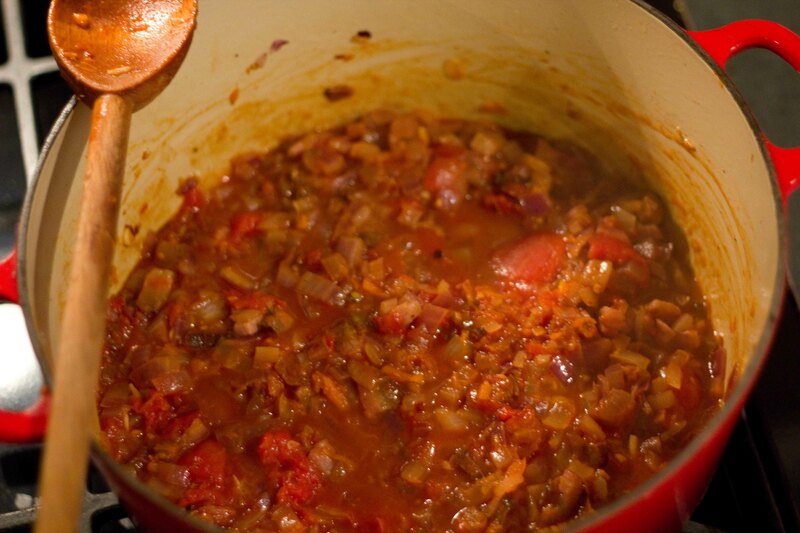 Season with salt and pepper, add the tomato sauce, reduce the heat, and simmer for 30 minutes. Right before serving, add most of the grated cheese, and stir it into the sauce. 2. Cook pasta according to the package directions, until al dente. Drain the pasta and add it to the simmering sauce. Add the parsley leaves, increase the heat to high and toss to coat. Divide the pasta among four warmed pasta bowls. Top with more freshly grated cheese and serve immediately.